We followed one track high along the ridge above the town of Palmela. From the vantage point in the shelter of a moinho (windmill), we looked out over the coastal resort of Setúbal. Up the valley towards the sea lay a handful of farms–we’d flown over the area many times, as it’s a key waypoint for light airplanes avoiding Lisbon’s terminal airspace. 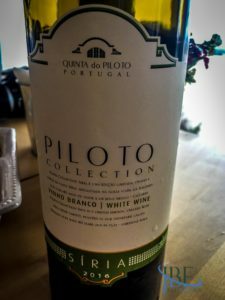 So it’s no surprise why we came to taste here: Down the ridge toward the Tejo we could see the white buildings of Quinta do Piloto. 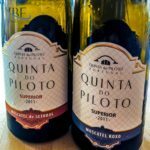 The name intrigued us as pilots (both aviating and sailing); the quality of the wines would soon cement our affinity for the quinta. With its own vineyards stretching across the hillsides and into the valley floor, the quinta has been making wines since the 1940s. We tasted this experience, and the legacy, in the wines. We opted for the Descobertas tasting, which included six table wines, evenly split between red and white, at €10 each. We also chose the “extra” tasting for an additional €5 each, which added two moscatels. As we have enjoyed moscatel from the region, we certainly didn’t want to miss theirs. The guide greeted us right away; we were scheduled to tour with another couple, but they called to cancel, so we had her to ourselves. While the tour itself didn’t take us through the vineyards because of the rain, the quinta sits within them, so you get a sense of the sloping terroir from the parking lot. The quinta possesses roughly 300 hectares under vine; it bottles only 50,000 liters each year, selling the remainder of its production to other wineries. The production facilities break down into two main areas: the older adega, complete with historic cement tanks and well-loved machinery, plus a series of new buildings that house more modern equipment, including the stainless steel tanks used for all white wine production. 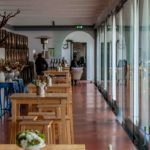 The tour takes you through the historic part of the adega, which we found the more interesting part to us, because of the quirky nature of classic adega wine production in Portugal. 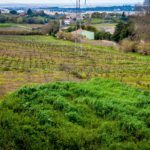 We’ve found that each adega or quinta we’ve visited that has been producing wines for generations has a special, homespun approach to its wines, often driven by the vagaries of the local grapes, weather, labor practices, and terrain. Our favorite of the table wines, one that exemplifies the unique process within the older portion of the winery, features a key grape of the Setúbal region: Castelão. The Reserva Castelão undergoes essentially the same vinification as has been plied at the quinta for generations. Using the hill as a gravity feed, the grapes go into a classic de-stemmer, then move to the series of cement vats for fermentation. 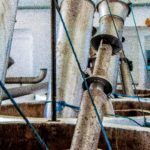 Featuring giant plungers to manage the fermentation, the vats showed the ingenuity of the adgea over the years. Without the temperature control of a modern winery or stainless steel tanks, the bold Castelão grapes transform, somehow, through this rustic journey into an elegant wine. After spending 1.5 years in new French oak, the Reserva Castelão goes into the bottle–3,000 bottles from this particular vintage–coming out at 14% ABV. 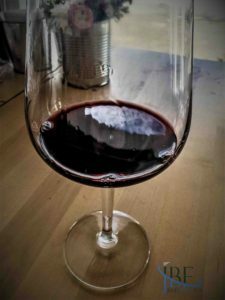 I instantly thought of coelho assado (roasted rabbit) when I smelled the wine–it’s a big “autumn” red with currants throughout and a bit of spice to complement grilled game scattered with coentros (cilantro or coriander leaves). The medium tannins give it structure and balance, and I swear you could also scent an echo of the cement from the vats. One of the joys of tasting at the quinta must be the ability to compare side by side, in situ, wines that are brethren but express themselves so differently. On this visit, we compared two of the quinta’s flagship Moscatels de Setúbal, a well-known dessert wine of the region. 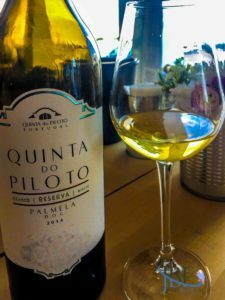 Having enjoyed many Moscatels over our years in Portugal, we can attest this is a variety you must try if you enjoy a sweet, yet nuanced, style of wine for an aperitif, or after a meal. 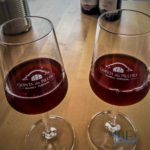 The two wines, one from the “standard” Moscatel de Seúbal grape and one from the pink-fleshed Moscatel de Setúbal Roxo grape, instantly mark themselves as second cousins. Not only are the grapes different, but the Roxo is unfiltered, so it appears hazy in the glass. Don’t let this put you off: It tastes clear as a bell. In fact, we likened it to the liquid from a tarte tatin, with lots of buttery baked apple. The Moscatel de Setúbal hails from the slopes around the quinta itself, taking a north wind, and close by the sea. 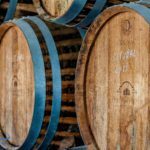 The wine spends five years in cognac barrels, like its cousin, and like it has 17% abv, but tastes very different: Think of caramel poured over roasted plums, with a bit of salt and smoke on the nose. These are both such fine examples of the type that we took a bottle each home with us. 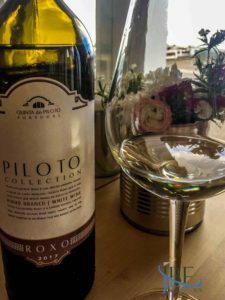 With a 12,5% abv, this mineral-streaked white has light florals on the nose with a hint of lemon, and a taste of stewed pear on the palate, making it a food-friendly choice for petíscos, poached fish, or a goat-cheese salad. The Síria grape is known as Roupeiro elsewhere in Portugal. This white wine crafted from the “pink” grape, the Moscatel Roxo, charms as an aperitif. The quinta picks the grapes early and treats them like white grapes, with less contact on the skins. The resulting pale straw color belies its intense nose of peach and flowers. A bit of natural fizz lifts the palate, which shows more peach. It’s dry but full of this blushing fruit. With 10,000 liters produced, it’s worth seeking out. A combination of Arinto and Antão Vaz, the Reserva white spends six months in oak, lending it the color of golden hay. 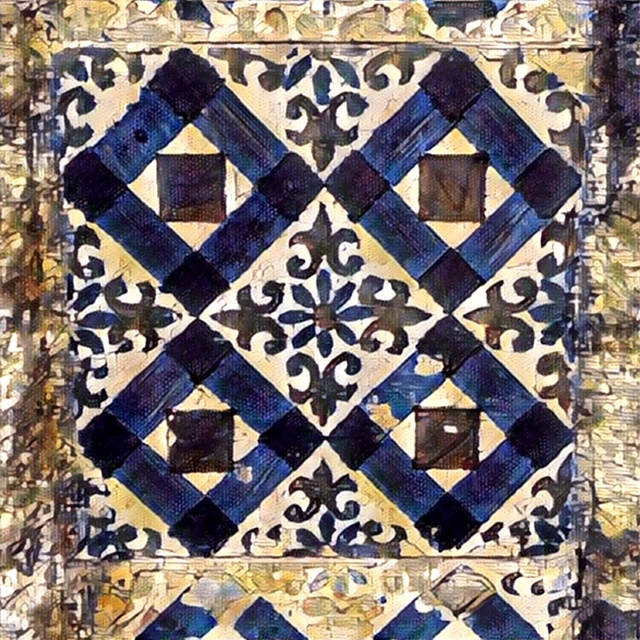 Antão Vaz has been called the “Portuguese Chardonnay,” and there are similarities in its expression, in this case, of golden sultanas on the nose and burned butter on the palate. However, this white adds more interest with hints of smoke and spice as well. At 13,5% abv, it’s a significant white with ample weight to complement roast chicken or a tagine with chicken and apricots. 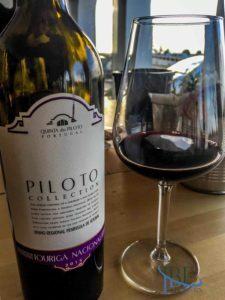 The hallmark Douro grape, Touriga Nacional, finds an interesting expression on the seaside hills of Palmela. After vinification, it spends one year in new French oak, which lends it a brambly character with cigar leaves on the nose. The 14,5% abv, medium viscosity red tastes of blackberry and has a hint of spearmint (horta). A good wine for grilled meats and hearty pork stews. 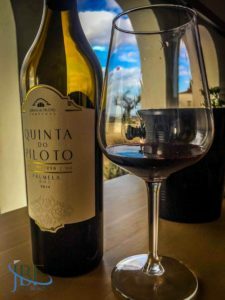 Quinta do Piloto sources its Cabernet Sauvignon from vineyards planted about 20 km inland, answering our questions about the viability of Cab Sauv so close to the ocean. The wine definitely shows its cooler-climate provenance, with lots of green aspects, though not out of whack, demonstrated by its alcohol level. It comes in at 14% abv, with green peppercorns on the nose, and green peppers and some black fruit on the palate, with a touch of red rose. A good one to have with steak au poivre.